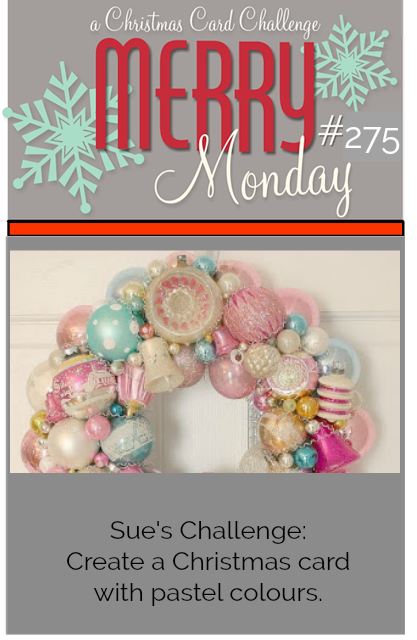 We have a new Merry Monday Christmas card challenge, Sue is our hostess and her challenge is to Create a Christmas card with pastel colours. I started with a pastel grey cards base and added some snowy texture to it. I then did some ink blending with blues and pink. 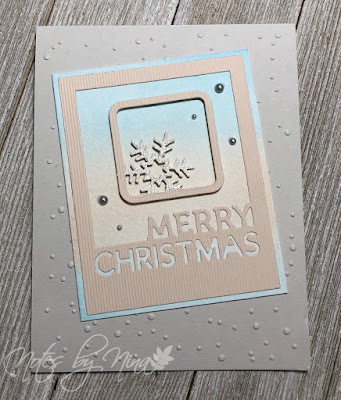 I used a holiday die cut for the centre panel, I masked off the snowflake and covered it in a winter wonderland embossing powder which is white with flecks of silver. I popped that centrepiece up with foam tape. I finished with some grey pearls. Supplies: Gray and pink cardstock, Simon Says Stamps - Holiday Frames, embossing folder and pearls. Be sure to stop by the Merry Monday blog to take a look at all the wonderful cards created by the design team. Play along with another great challenge. Gorgeous Nina! I love the snow texture and your blending is perfect...have a good week - hope you guys haven't had tons and tons of rain/snow that was forecasted?? Take care! Very pretty. 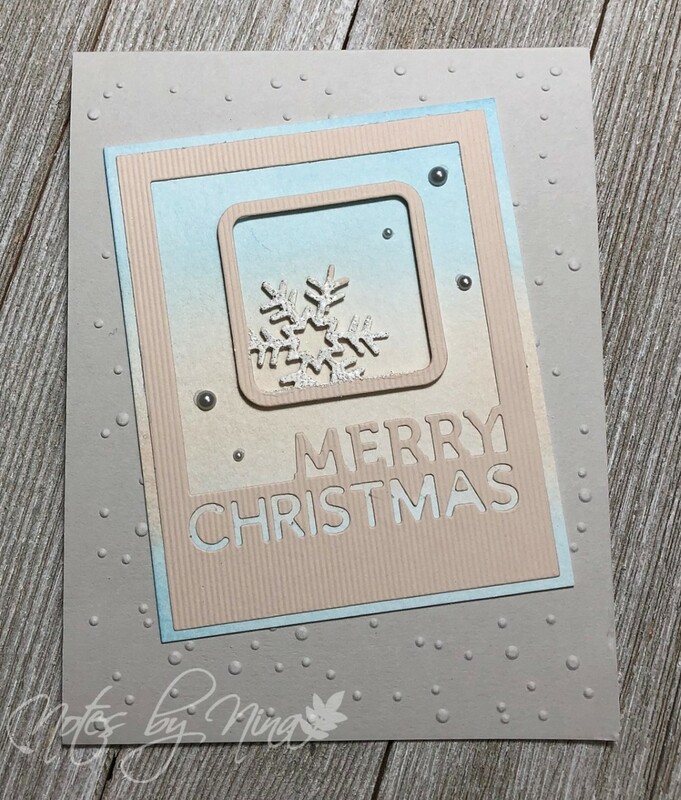 Love the soft colors in your blended background and the sparkly snowflake. So soft and pretty Nina, a beautiful Christmas card. Nina, this is so pretty. Have a great week. Beautiful ink blending behind the diecut, Nina! Perfect with the shimmer on the snowflake & the pearls!! love your card ...sorry I have missed so many of your beautiful cards ...will try to do better . So fabulous as usual! I love your take on pastels! GORGEOUS! Lovely background, Nina, so soft and pretty, very striking with your layers! Nina, I love your soft background it's a perfect pastel color combo. Have a great weekend!